Synergy Beading Wire .024 - 49 strand - 110ft. 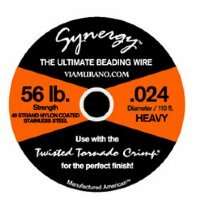 Synergy110 - 110 feet of beading wire excellence! Pay for 100 feet and get 10 feet FREE! Synergy Beading Wire® takes the guesswork out of choosing the right beading wire. 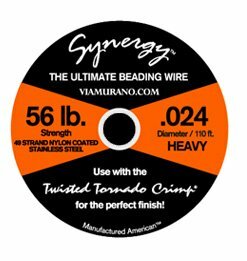 All Synergy Beading Wire® is 49 strand nylon coated stainless steel, and they are Manufactured American™ by Via Murano®. We have engineered Synergy Beading Wire® to be the strongest and most supple beading wire on the market for durability and elegance in your designs. It's strong! It's supple! It makes stringing easy! Available in .015, .019 and .024 sizes. Use with our Twisted Tornado Crimp® for the perfect finish! You can earn 48 Club VM Points on this product! Click on the radio button next to the bundle that you are interested in and then click on the "Add to Cart" button above to add the bundled products to the shopping cart.